Lina Todd began in the casting business around 17 years ago in New York starting as an assistant on such films as “Silence of the Lambs" and “Reversal of Fortune". Her first film as casting director, was "Little Man Tate", Jodie Foster's directorial debut. Though based in New York, Lina enjoys working internationally and brings American actors to foreign films and vice versa. She is the creator of the "Rising Stars" program at the Hampton International Film Festival, now in it's six year. Certainly, the Berlinale is always worth a visit for her! She continues to participate as the only American casting director at the Shooting Stars events, and this year she was a panelist at the Talent-Campus for „We'll Get Back To You - A Casting Workshop”. What do you love being a Casting Director? There are so many things I love about it. I love the whole process of creating a film. I love to be able to realize a script - this imaginary world of the film. I love auditioning and drawing actors out. I love the social and creative aspect of this. It’s gorgeous getting to know new actors, when someone enters the room, and just blows you away. Prior to casting I worked as an actress doing avant-garde theatre and experimental films. My mentor was Joseph Anthony, an original member of the Group Theatre in the 70-ies. I got my masters degree in directing at Columbia University in NY and trained in many conservatory-acting programs as an undergraduate including Bard College and SUNY Purchase. It was my work as an actress and director that drew me to casting. That is why I love my job. Coming from an acting and directing background, people I knew in the industry started asking me more and more for recommend talented actors. And I understood what was needed. So it became my profession. What did you cast at the beginning of your carrer? Among others such as “Little Man Tate” with Jodie Foster, I cast approximately 30 films for The Shooting Gallery (which was a major force in the independent movie era) including the Oscar-nominated "You Can Count on Me." I also cast for other independent companies majors including “Nicholas Nickleby” for United Artists. What are you casting right now at the beginning of the year? The Jennifer Chamber Lynch movie “Surveillance” starring Julia Ormond. It is a German co-production with David Lynch as executive producer. I am also currently casting “Life is Hot in Cracktown” by writer and director Buddy Giovinazzo who lives in Berlin, although the film is shooting in L.A. It stars Kerry Washington, Illeana Douglas, Michael Rapport and many others. Two actors I have been really excited to cast were Mark Webber a former Hampton Rising Star and Evan Ross. Diana Ross' son. I am also casting "Paul Newmann Meets Doctor Comfort" starring Jeremy Davies for Sidetrack Pictures. Which movie is shown on the Berlinale? Jay Anania`s “Day on Fire” was shown in the section called Berlinale Special. This wonderful movie already premiered in Toronto, starring another Hamptons Rising Star, Carmen Chaplin. Raised in France, Carmen is Charlie Chaplin's granddaughter. Olympia Dukakis and Martin Donavan are also in the film. You were also invited as an expert on this year`s Talent Campus. For which event? It was the casting panel „We'll get back to you - A Casting Workshop” on the first Sunday at the Talent Campus. 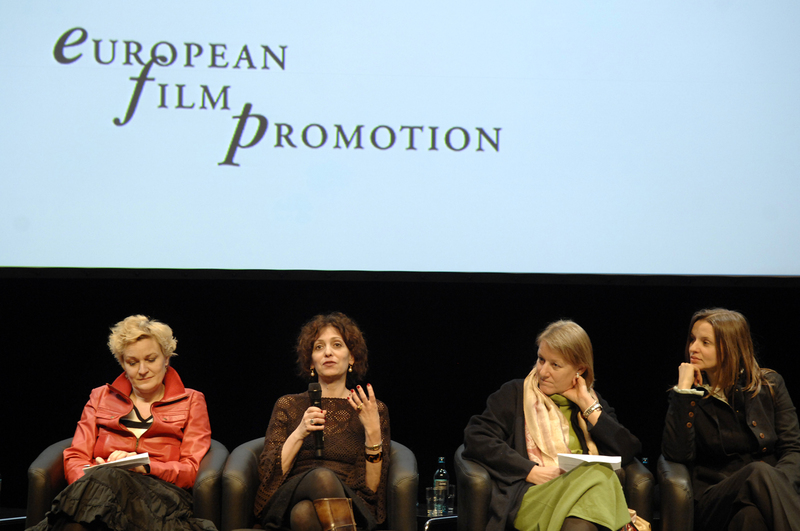 Nancy Bishop, a casting director from Prague, was the moderator and included among others for example Anja Dihrberg and Cornelia von Braun from Germany, Beatrice Kruger from Italy, Rie Hedegaard from Denmark, Patrícia Vasconcelos from Portugal and the Polish Violetta Buhl. We discussed the relationship between the casting director and the actor: Is the Casting Director friend or foe to the actor? We also discussed trends in casting, for example type casting, casting genres and finally international perspectives on casting. Which advice would you give a young talent in the movie business? Study and train. That’s essential. Develope your craft and dynamics. Trust yourself and your instincts. What is interesting to a casting director and audience is to see the real you shine trough. Relax when you enter a room for an audition, inhabit the space and make it yours. Also, know we are on your side, we want you to succeed. Develop relationships with people in the industry, and try to get a good agent, because it’s nearly impossible without an agent to get the good auditions. What makes for you a good photo and cv? I like the actors to look like themselves. It`s embarrassing for both sides, when you have an old picture of the actor, he comes to the audition, and looks totally different. The photo is very important but even more important is the resume. What have they done? What directors did they work with? Where have they trained? There are good schools and coaches which I pay close attention to. It’s very important to see them live because pictures are static. The actors have to show their range of acting: all the different parts they can play. Sometimes an agent sends us a demotape with scenes from movies of the actor and sometimes the whole movie. That helps. What is the difference between the casting scene in N.Y and L.A./Hollywood? It’s not really that different. It’s just that there are more actors based in L.A than in N.Y. That’s it. So you really have to cast from both coasts. I spent a lot of time going back and forth from New York to L.A. to cast a film. Where do you see the future of the majors? In many ways independent films are becoming similar to the majors in concern to their casting requirements. However they still are small artistic projects that will never be mainstream. Much of the money to make movies is coming from the same pool of financiers but the majors have more money for distributing and marketing. In which direction does the online business develop in the US? It is developing more every day until now. Breakdownservice has been the traditional source for casting directors but new companies such as www.screentest.biz are sharing the market. I feel this is important to revolutionize and democratize the casting projects for all actors around the world whether they have agents or not. When the casting director begins the process of casting “she” emails a character breakdown to his service or up-coming casting sites and these casting descriptions. The agents have access, read these announcements and finally submit a list of actors with photos and cv. Do you think that the internet is able to extinguish the profession of Casting Directors? Definitively NO! You still need somebody who knows the actors work and range. The internet can’t make these decisions. It can just present you with ideas. For example take Renée Zellweger in “Bridget Jones”: A database could not tell you that she could play a chubby British girl. That takes imagination, something a database can not do. Also casting directors has close contact to agents and managers who know their actors best. This communication is personal and essential when making creative decisions. It’s like Microsoft Word, it can`t form creative sentences for you, it only gives you a basis. The internet just gives guidance to the Casting Directors. And the internet can’t negotiate the Casting Director even has to! What is frustrating for you in the business? At times it can be frustrating balancing "Art and Commerce". I believe strongly that the right artistic choices are essential for a brilliant and successful film. What an audience is ultimately left with, when leaving the theatre is the performance - that is what resonates and illuminates the script, the film, the experience. There are so many, but primarily I am interested in the work of directors like Hitchcock, Godard, the Italian Neorealists, Almodovar and other experimentalists like David Lynch or Kar Wai Wong. Thank you very much, Lina! Attached you can find a photo of the casting panel!